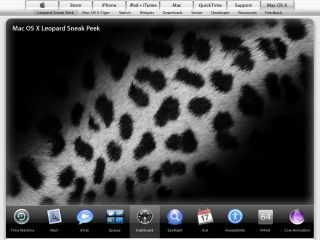 Mac OS X Leopard still "barely in beta"
The next version of Apple 's OS X operating system still looks like it'll drop in late spring, and may not even arrive until June. That's the assessment of Mac developers who claim that the latest builds of OS X 10.5 Leopard are "barely beta, not final or Gold Master", according to Ars Technica . Speculation among Mac fans has been rife in the last few weeks, partly because Apple has sent invites to a special event at the National Association of Broadcasters ( NAB ) event in Las Vegas, which takes place mid-April. However the event - dubbed Lights, Camera, Apple - looks set to focus on Apple's pro media editing apps like Final Cut Pro . 8-core Mac Pro desktops are also rumoured to be making their debut then. Given that developers already have their hands on beta versions of Leopard, it also looks unlikely that Apple will launch the OS too far in advance of its Worldwide Developers Conference ( WWDC ) which takes place on 11-15 June in California. This has certainly been the pattern with previous versions of the operating system. Both Panther and Tiger arrived just one or two weeks in advance of the WWDC.